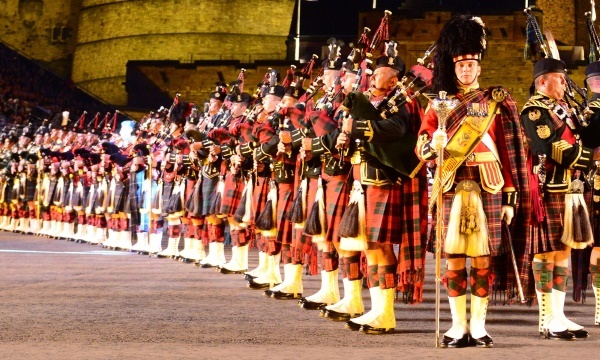 Enjoy Scotland’s world famous military tattoo with pipe bands, Scottish dancing as well as a dash of the unexpected (an event which has been taking place here, in Edinburgh Castle, for almost 70 years) with our 2019 Edinburgh Tattoo Tickets and hotel accommodation packages. Set against the magnificent back-drop of Edinburgh Castle, Edinburgh’s world-famous Royal Edinburgh Military Tattoo has an electric atmosphere, buzzing with visitors from across the globe all there to take part in this momentous event. The Edinburgh Tattoo is a spine-tingling event which will include pipers, drummers, singers and dancers including the world-famous Massed Pipes and Drums. Every year the Tattoo begins with a vivid and intense display of traditional values to the stirring sounds of ‘Dumbarton’s Drums’, ‘All the Blue Bonnets are over the Border’, ‘The Garb of Old Gaul’ and of course ‘The Skye Boat Song’ and, in a moment of calm, the Tattoo closes with the haunting presence of the Lone Piper on the Castle ramparts. Finally the skies above erupt with a jaw-dropping display of pyrotechnics – the Edinburgh Tattoo’s finale firework display. Since it first took place in 1950 over 12 million people have travelled to Edinburgh to see the spectacular that is the Edinburgh Military Tattoo. Don’t miss out on your chance to experience this truly breathtaking event. Every year the Edinburgh Military Tattoo brings together a rich variety of cultures and heritage from across the globe and showcases impressive military precision, striking music and a whole host of entertainment. Our breaks include tickets for the Royal Edinburgh Tattoo, accommodation and breaksfast for the relevent number of nights. Our two night breaks start at £194 per person whilst our one night midweek breaks start at just £134 per person. Three and Four Star Packages with top price seats for the Royal Edinburgh Tattoo including a stay at the lovely 4 star Crown Plaza Royal Terrace Hotel, with excellent facilities including a lovely bar and restaurant, a pool and a gym, just the other side of Calton Hill. Further information on the hotel and other central Edinburgh hotels can be found by clicking on “Book Now” button. Use your Tattoo Break to check out the Edinburgh Festival. During August, Edinburgh is also home to a series of high profile festivals including the biggest arts festival in the world: The Edinburgh Fringe. Make sure you save a bit of time to see some great performances or just explore the streets and experience the unique atmosphere. Don’t just stay for one night! The Festival is on at the same time! Nearest Train station to the Edinburgh Castle is ….Edinburgh Waverley StationWhen can I see it?